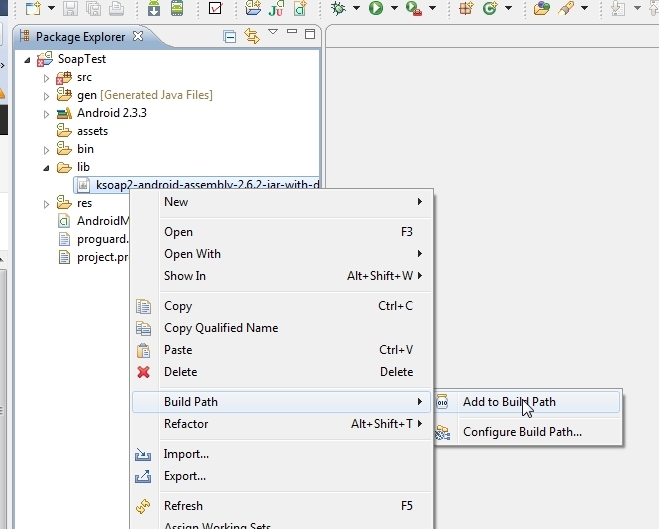 When trying to access Magento SOAP web services v2 from Android, after some searching on web, I found that ksoap2-android project could be useful to implement SOAP client in android project. (Ksoap2-android is lightweight and efficient SOAP client library for android platform). Next step was to figure-out how to use it. After some additional investigation, I found that it is pretty simple to use, when you get used to it once. 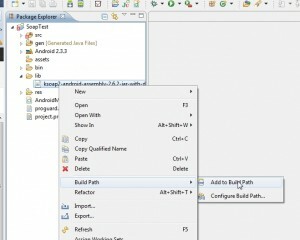 First of all, let’s create new Android project, I set it to be for android 2.3.3. After creating new project, we need to download and import ksoap2-android library inside the project and add it to build path. 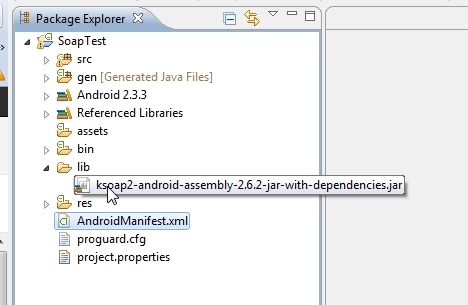 When download ksoap2-android-assembly-2.4-jar-with-dependencies.jar, make additional folder inside your android project, call it for example “lib” and paste ksoap2-android-assembly-2.4-jar-with-dependencies.jar there. After that, right click on pasted file in package explorer (assuming that you are using Eclipse) and choose: Build Path -> Add To Build Path. Of course, If we want to access Magento web services SOAP API, we need to go to Magento installation’s admin area and under System/Web services/Roles create Role with appropriate resources (for development purpose, we can mark them all), and then System/Web services/Users create new API user. After that we need to assign roles we created to user in order to make the whole thing work. We will need user-name and apiKey from there to be able to log-in with our SOAP client. Now, we are ready to start developing out test application. After that, lets create our request object and assign it to envelope. We are going first to call “login” method to Magento API in order to authenticate and retreive the sessionId. Of course, we have to add request parameters to login method, and it’s done with request.addProperty and then assign request object to envelope. After this basic steps, we just have to make SOAP calls same way to other web service methods, and provide retrieved sessionId in each call. As we can see in LogCat window, we got customer list object with child objects as response. If you want to find out what methods in Magento API v2 are available and what parameters should be used for request, just open URL: http://yourhost.com/api/v2_soap/?wsdl=1 and you will see all available methods and their request and response parameters that can be used. Of course, don’t forget to set android.permission.INTERNET in AndroidManifest.xml file. Hope that you will find this post helpful in own projects. Cheers! How to do this with WS-I Compliance ON? we are using 2 shipping methods in our magento site. we are doing Android app for our magento site. when we use default shipping methods [ example : “Table rate shipping method ” ,code : “tablerate_bestway” ] shipping charges are working fine in site and in andriod app. this is the problem. what we need to do so that shipping charges should work in andriod app when we use custom shipping method. I assume we have to create an custom API for this. If so how i can write the custom API for Shipping extension to work in app? we followed the follwing link to create a api username and key in magento admin panel. from this api key and username we are getting the session id . We are trying below code for display customer list. But We are getting below error. Could you please help us for ? but we did lot of customization for this site. after customization we can not able to get the session id. please help what i have to do to get the session id for the customized site. How i get this data in json format. Please help me. Hey, Do u get any solution to get response in JSON ? Hi, thanks for the code. Quite helpful. But I am wondering how exactly it should be, if I want a customer to login through the Android App, with the customer’s own email/password of course. It seems I cannot find it in Magento’s Soap API, no related functions. can you tell me how to pass the complex data type into request. How can we pass 2 parameter for fillters ? i tried to solve the error but i get the null in execption block just null. this gives me null all other works fine. cam you help me out?? i also give permission. i am using this code but my session id is neither created nor shown in logcat. this is my coad , plz tell me whats the problem and how it resolved? I already solved the “filter” problem. I am trying out same example. But its not working in my case. Is there any issue with this version. On which version you have tried this example? I’m trying to get a list of products that contain a certain string from the server. Note that I have successfully used the call method to get categories. What am I doing wrong with the filters? just remove the wsdl from the URL it will work like a charm!!!! "Your data values are: 'product_id'=> "
+ productMap.get("product_id") + ", 'product_name'=> "
here, productList contains reponse from the server. I am able to sort out my issue and have got session id and response successfully. I got stucked at passing filters to retrieve specific customer from list. Please give me any hint. I have posted a comment but you dint replied yet. Please try using another URL. I was facing same problem and i have tried using another URL. Thanx a lot for your guidance Sir. I was trying with SOAP magento api, but didn’t get through. It was still giving XMLPullParser Exception. I didn’t know what was going wrong. However, I got it worked with XMLRPC magento api in my android app. I am able to get the Catalog details in response from server after giving external IP address. How to parse CustomList response? Thanx alot sir, for your fast n kind reply. I’ll do the things suggested by you. I was just scratching my head. I think now my problem will be solved. If you don’t mind can you mail me your gmail id please. @Viay, please read the comments above. If you are trying to connect to localhost from same computer’s emulator it will not be possible. You need to have external IP address of your web server in order to be able to connect to web service. Get yourself Charles application and see what response are you getting from magento. Thanks U so much sir for your quick reply. I have include the following library..
ksoap2-android-assembly-2.4-jar-with-dependencies.jar in my android project. I had also created the web service user and role and assignment role to user in magento. I have installed magento 1.7 on my local machine. Following is the code… pls tell me where I am going wrong and what else is required to configure. The link provided by you in above reply, there is some php code, but I am not getting where to write that code if I am developing an android project for consuming magento web services. @Vijay, would you be so kind to read http://inchoo.net/ecommerce/magento/magento-v2-soap-demystified/ and here you will find an answer on how to get SOAP web service working on Magento and also to see if you missed to configure something or even if you entered wrong URL for SOAP. Please, help me. M getting the XMLPullParser error in andorid while connecting to magento web service. Please, give me your email id asap. I installed Magento in my local drive so my link is http://localhost/magento/api/v2_soap/ right?? I get error and can not get Customer List .. i am sending you my log .. please help me ..
@anurag, it seems to me that you are trying to reach localhost domain from android emulator or attached device to your computer. I don’t think that this is possible to accomplish this way because of some Android limitations. Please make sure to get some external domain name and then try to connect to your local web server via external ip/URL address. Second possibility of this problem is maybe that you forgot to allow internet access in your Android manifest. Thanks for previous reply and as well as for next reply. Hey I got above solution.I have changed URL and problem is solved. But will you please help me again ? I am facing another problem. I am sorry, but I can not reproduce your problem right now. Please try to check if soap output is in proper xml format or you are getting something else in response from server. It seems to me that you didn’t get proper SOAP response. You have explain fantastically and in very easy manner. when I tried same code, XmlPullParser exception expected START_TAG…..” exception is raised. I surf many website to find solution , but I can’t get it. But, I am getting the exception at line 42,where you are calling the webservice.The exception is “XmlPullParser exception expected START_TAG…..”. I tried to find solution on google but i can’t get. @Vineet, I am sorry, little mistake in link to ksoap android library. I edited post, so you can download proper library now. Thank you for this posting code. But when ever i try to run this, i am getting NoClassDefFoundError exception. Also it seems HttpTransportSE is not present in the ksoap jar file. I am getting error when i include the same. I replaced this with HttpTransport.